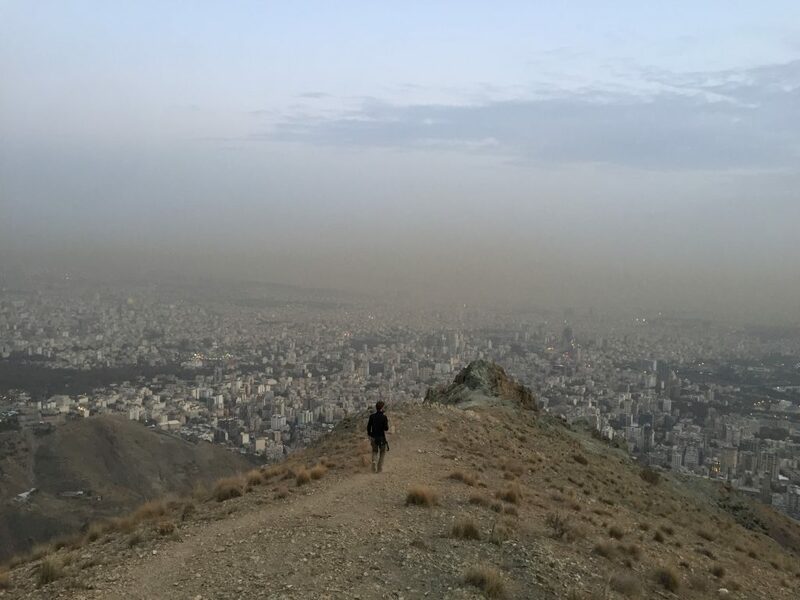 After great stories of friends and colleagues, the documentaries of Thomas Erdbrink, and curiosity for a land with few tourists, we decided for a non-standard option: Iran. Too be honest, we didn’t know exactly what to expect, but it turned out that this was going to be one of our best holidays ever. The phrase ‘meet the local people’ that we read in the Lonely Planet before departure turned out to be one of the most important things we did in our holiday, leaving a lasting impression even after we returned. 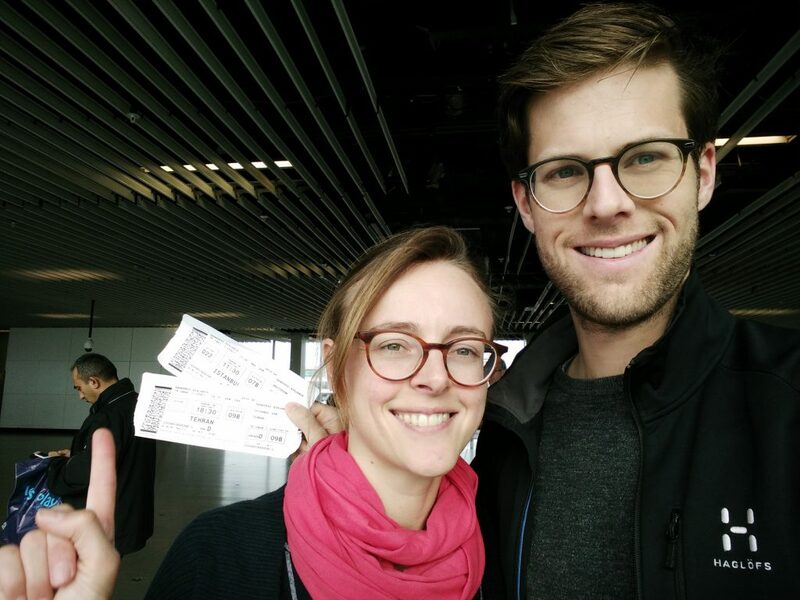 It also surprised us how cheap the flight tickets to Iran are, how easy it is to get there (for example with Turkish airlines via Istanbul), and how nice the weather is in October/November. Two weeks turned out to be a short time, as always, but it is enough to see the main cultural-historical highlights of the country without being in a rush. Our trip started on Sunday, October 22. 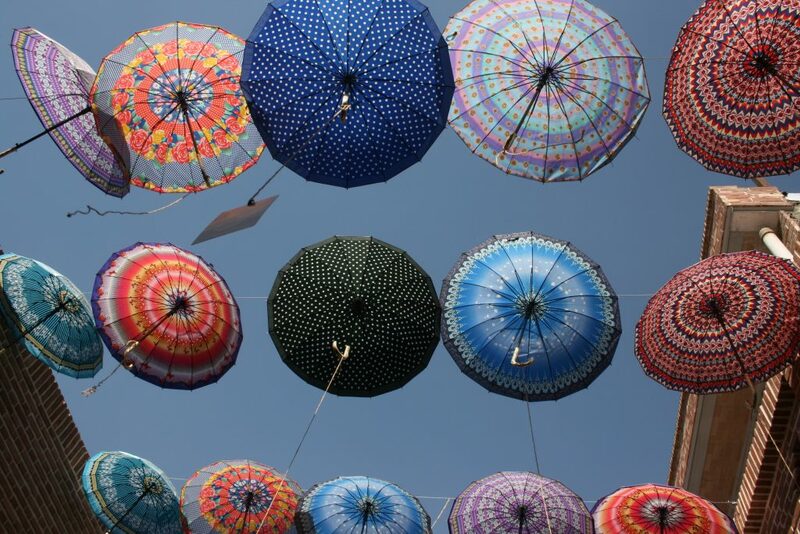 Departure at 12:30 from Amsterdam to Istanbul, then Istanbul – Tehran. Very good flight and meals with Turkish airlines. 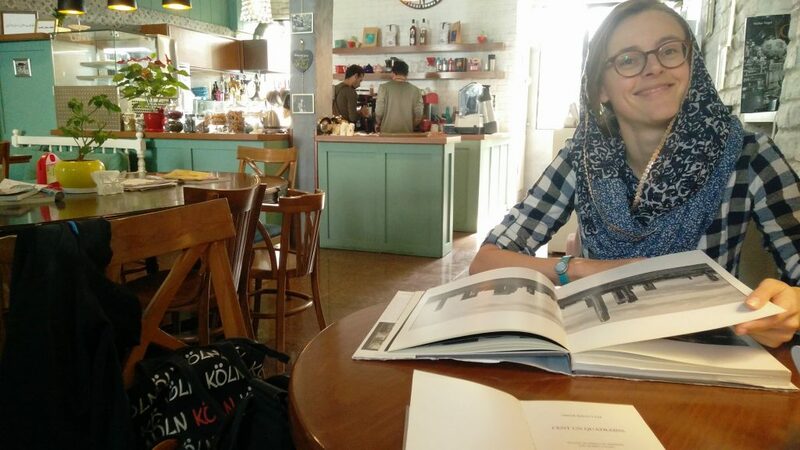 In Istanbul already we encounter first signs of Iranian hospitality, we get several suggestions for staying and eating in Iran and telephone numbers in case we need any help. We arrive late at Imam Khomeini airport, 22:30 local time. Lisa now has to put on a head scarf, which is strange and uneasy. We arrive at the visa office, which seems very unorganized and chaotic. It appears that we first have to get insurance (which we have been able to skip), then pay for the visa at the bank, then fill in a form, give it to a lady, who in turn gives it to a number of officers and then our passports disappear and the waiting begins. More than an hour later we finally get our passports back and are ready to enter. Maybe it took long because we didn’t apply for an E-visa? We don’t know but there are many other frustrated travelers. We are able to exchange some Euros to Rials at the departure level for a good rate and take a taxi to the city center (75000 toman, so 16 euro, which looks like a good deal). We arrive tired at our hostel, Persian Hostel, where we have a good night of sleep. October 23: breakfast at the hostel and into town. 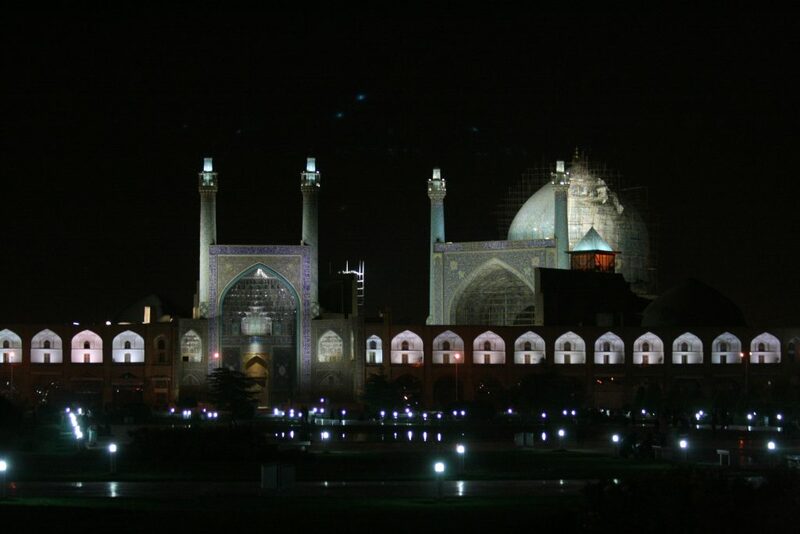 At Imam Khomeini sq. 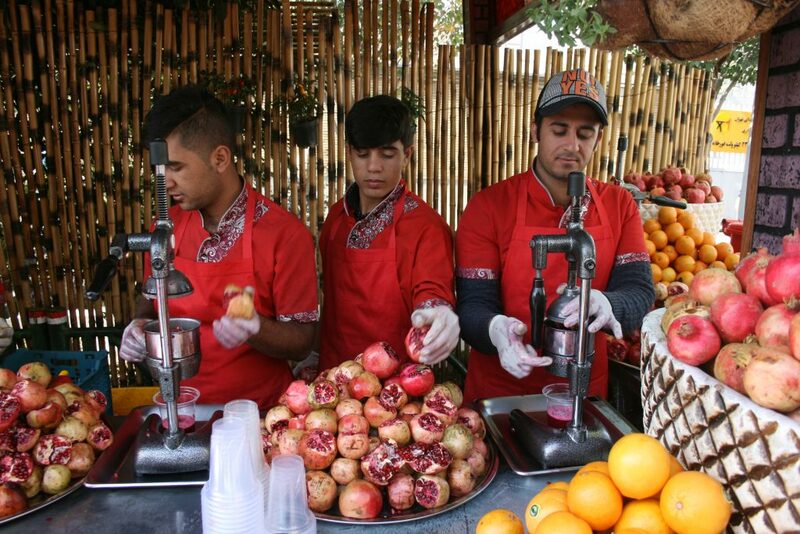 we buy a SIM card and then continue towards the Bazaar but not before getting freshly squeezed pomegranate juice. 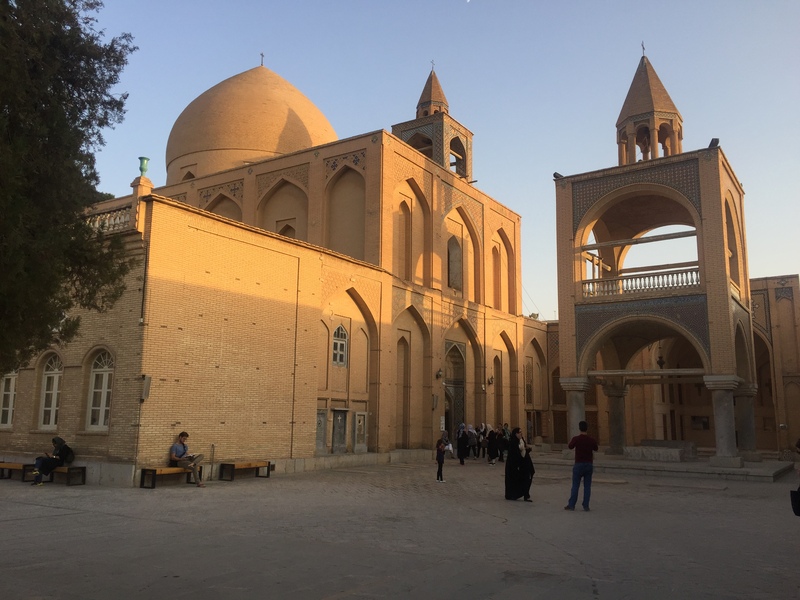 The walk towards the bazaar and the Imam Khomeini mosque is super nice and the weather is perfect, around 23 degrees and sunny all day. After the mosque and part of the bazaar we get lunch at Timcheh Akbarian, which was hard to find, but worth the effort since we can lie down with dizi and bread and herbs, followed by tea. Afternoon is filled with a visit to the Golestan palace, a quite impressive place mostly originating from the Qajar rulers (19th century). Some rooms are filled with glass and mirrors and would go for kitsch by current standards, but clearly at that time it was to show the power of the rulers to foreign entities. The wind towers are amazing. 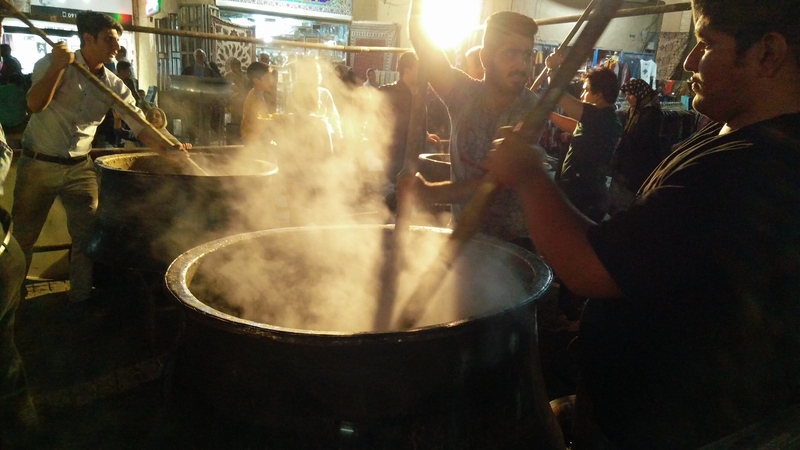 In the evening we take the metro to the Tabiat bridge and have dinner at super friendly Khoone restaurant. October 24: visit to the former US embassy (the ‘den of espionage’) is super interesting, including a tour in English. 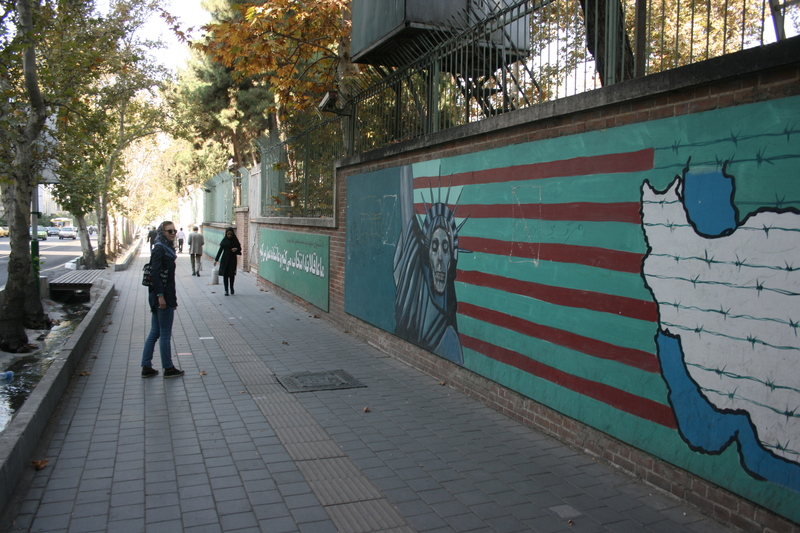 Close to the former embassy is the Iranian artist forum where we get lunch. 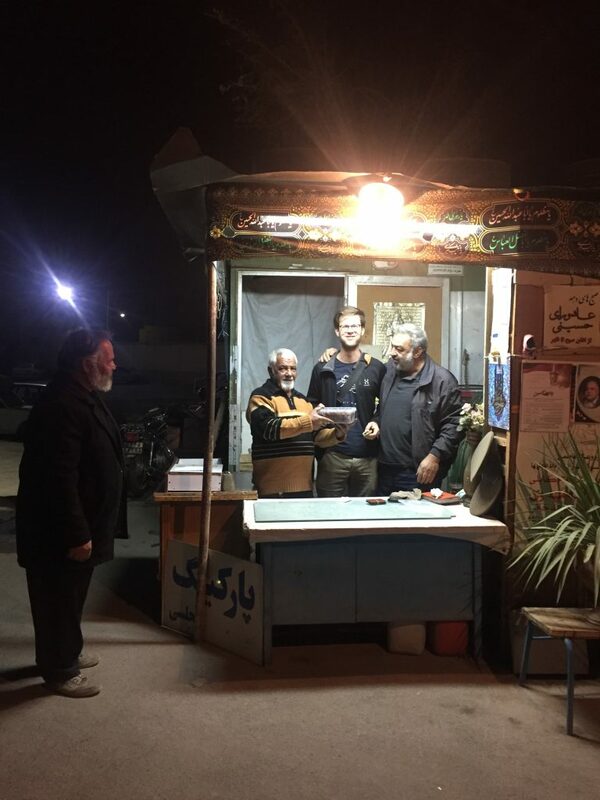 We encounter more signs of Iranian hospitality when trying to exchange cash: a young guy on the street is super enthusiastic and eager to help us and wants to speak English as much as possible. 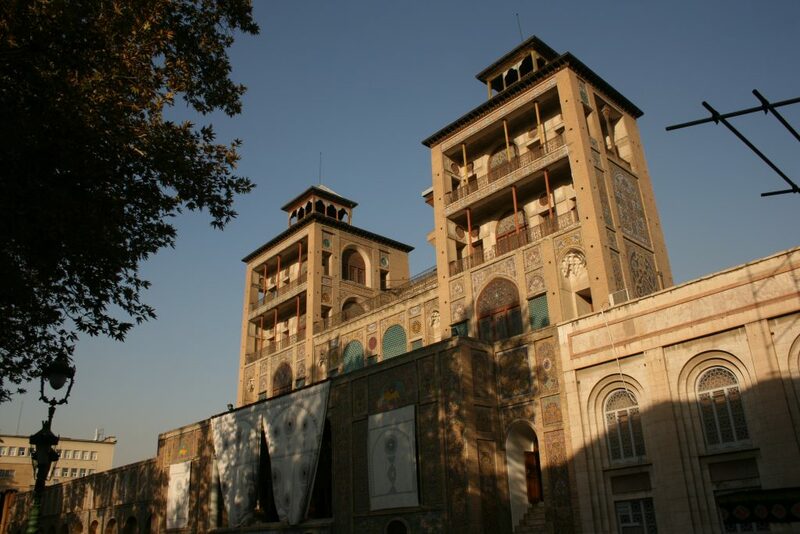 Metro-hotel-metro and then bus to Kashan. Again people around us help us all the time in getting to the right bus. Kashaaan Kashaaaaaaaan even continues on the highway. Close to Kashan many people in the bus help us in getting a taxi, and eventually the father of one of the girls in the bus brings us home (and will be our driver in two days). 25 October: In the morning we visit the merchant houses, Tabatabae, Abassadi, Hammam. Incredible!! 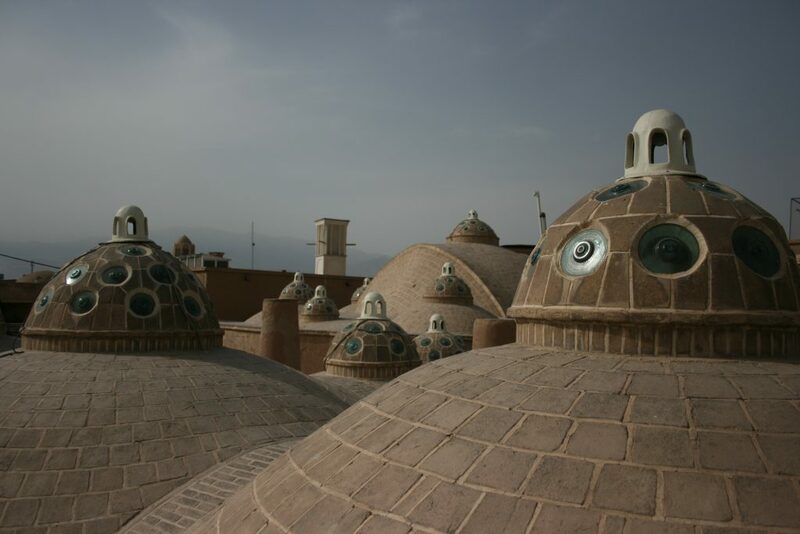 The hammam roof looks like the Tatooine planet from Star Wars. 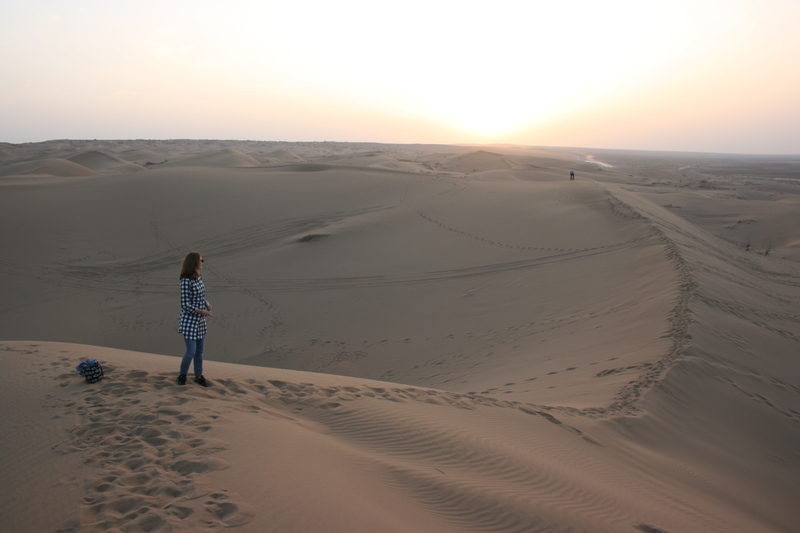 Afternoon is tour with Mahdi, our own driver, to underground city, salt lake, sand dunes + sunset, and the holy shrine of …? 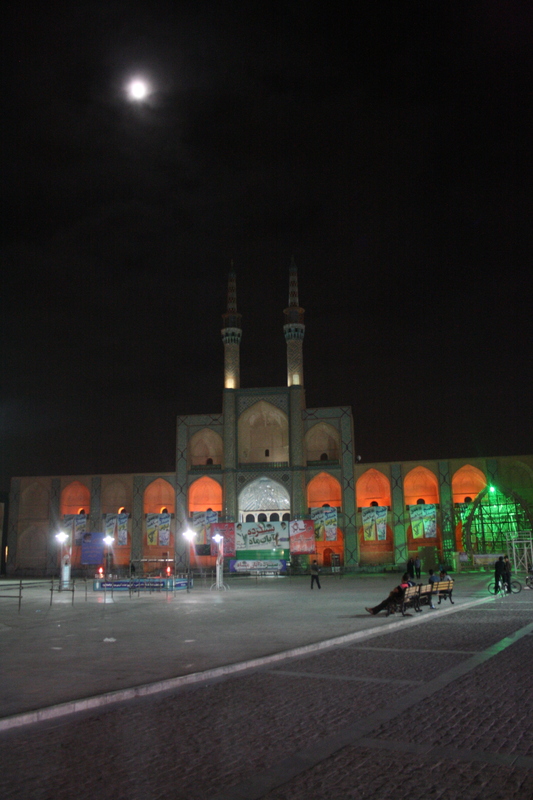 The surprise of the day comes when on the mosque’s square Benjamin gets a red (martyrdom) flag as a gift with the text, ‘ready for Imam Hossein’, ‘ready for Imam Mahdi’. Mahdi explains his difficulties in getting a girlfriend: he needs a good job, a car, good family, and a house at the right place. 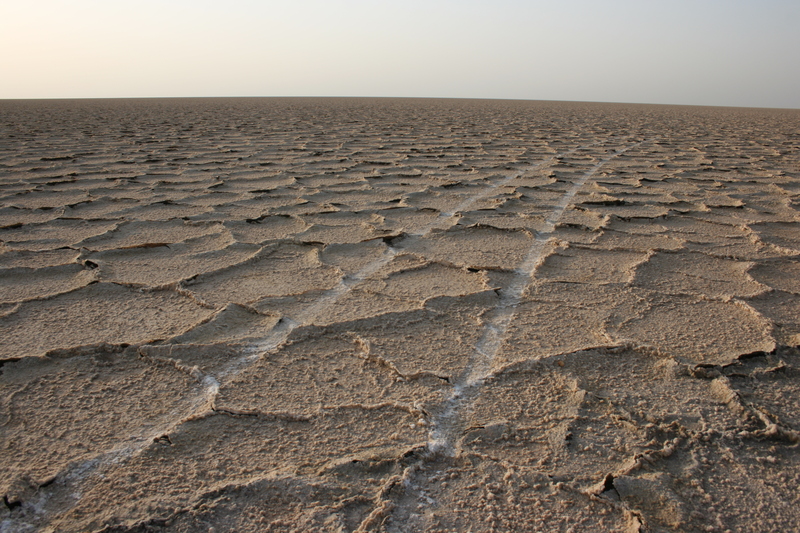 26 October, Thursday: our driver, again named Mahdi, waits for us at the hotel. First Fin garden, then Abyane (great view from the castle), nuclear site, Natanz (mosque and superb lunch), and then to Esfahan. Our driver is not so good in English but he is a real entertainer and we have a great time. 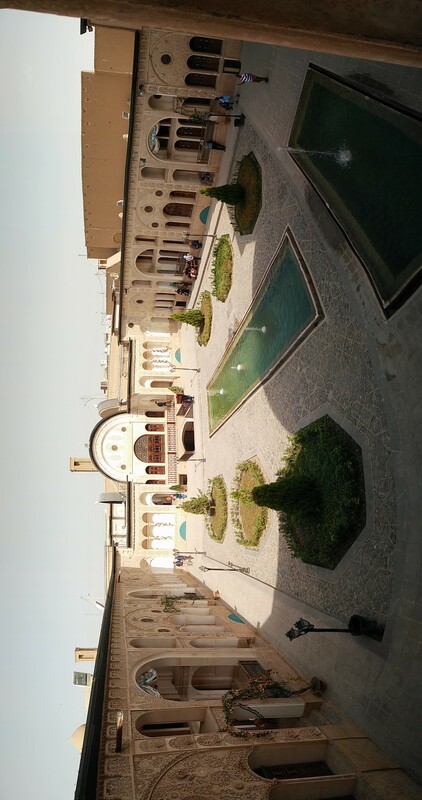 In Natanz we pass by the mosque and the ceramic shops, but the highlight is one of our best kababs, including soup, drinks and rice, for just over 2 euro. One of our best lunches in one of the simplest restaurants. 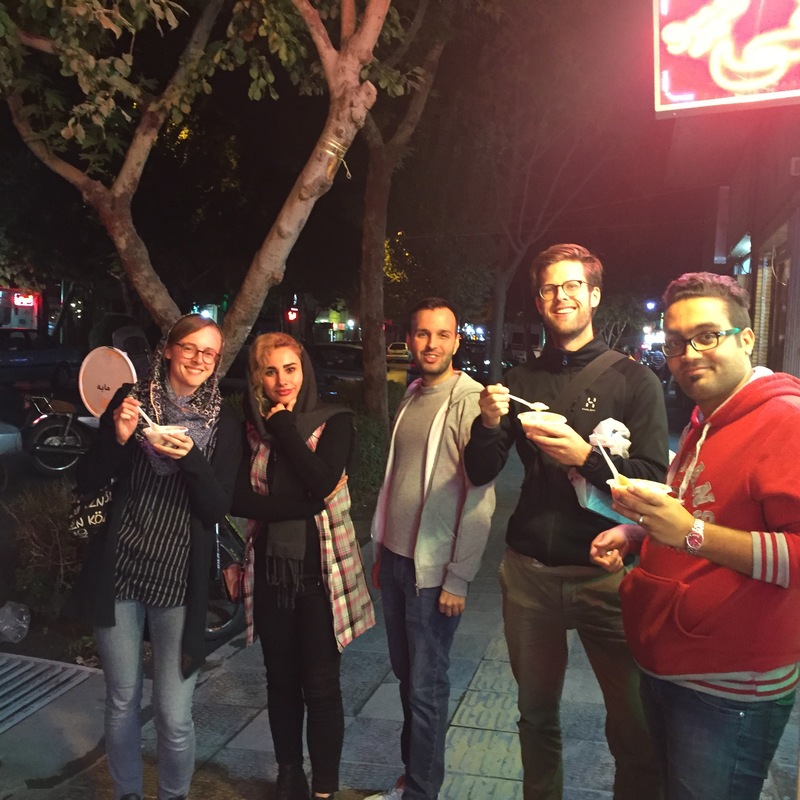 In Esfahan we take a simple dinner at a sort of Iranian fast food restaurant, we get more than we can eat for less than 3,50€ per person, including drink. A short evening stroll brings to the Jammeh mosque, where again we are treated with hospitality. First we get cakes (and spray) at a perfume store, then tea, wraps with cheese and herbs, and dates, when we pass by a parking lot. October 27: It’s Friday: weekend. 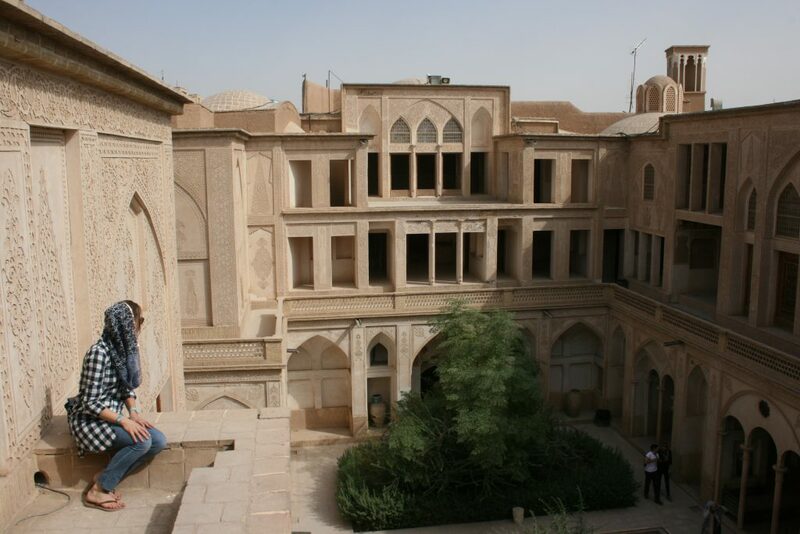 We transfer to another hotel, Isfahan traditional, and head into the city. The bazaar is almost completely empty. 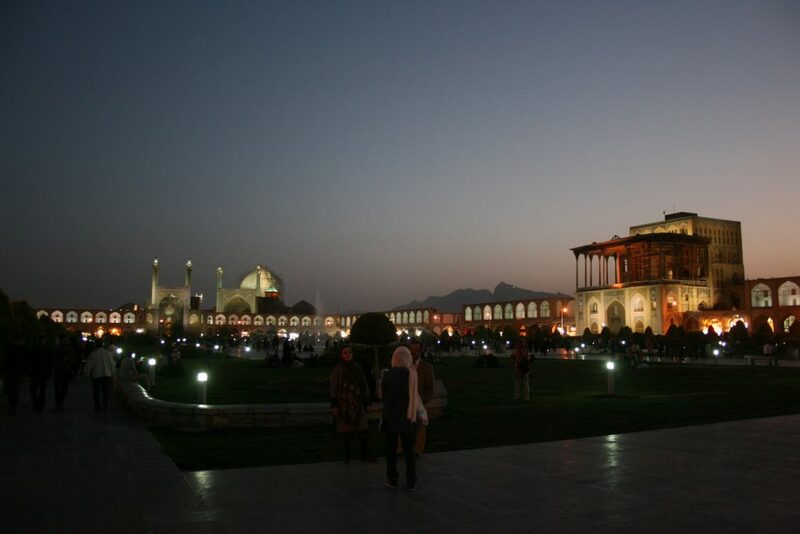 But then, suddenly, we arrive at the magnificent square, Naqsh-e Jahan. Quite likely that this is the most beautiful square in the world. It’s still quiet and the sun forces us to the shadow. 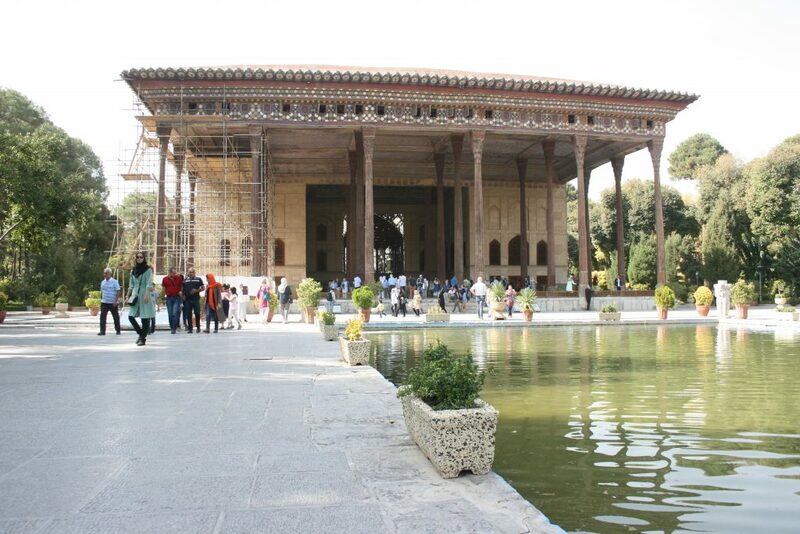 We walk to the Chehel Sotoun palace, with the wooden columns and magnificent wall paintings from the Safavid era (?). For lunch we have beryani, a local dish consisting of lamb minced meat inside a flatbread, and complemented with dough, a sour and salt yoghurt like drink with herbs. 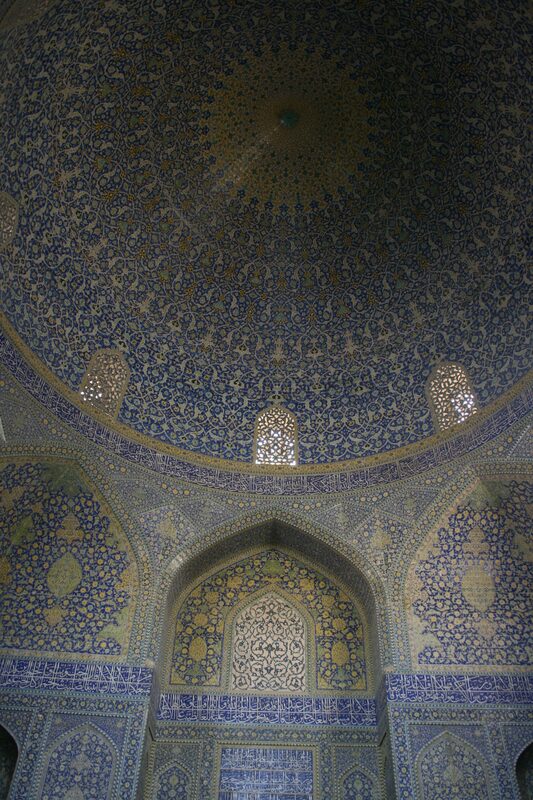 Then we go to the highlight of the day, the Shah mosque. 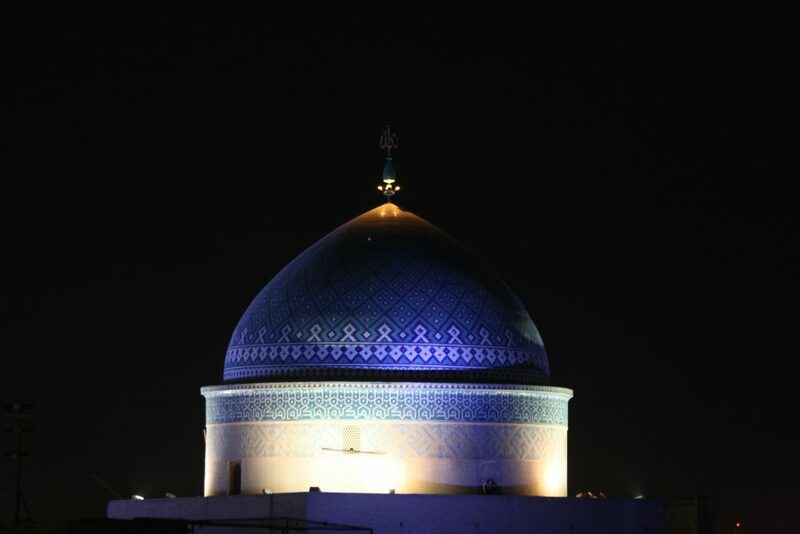 Extensive restoration work is going on, including removing and repainting the tiles of the outside of the dome.When we are about to leave, the sun starts to set slowly and casts warm lights over the mosque. The square starts to fill with people, enjoying the last lights at perfect temperatures. 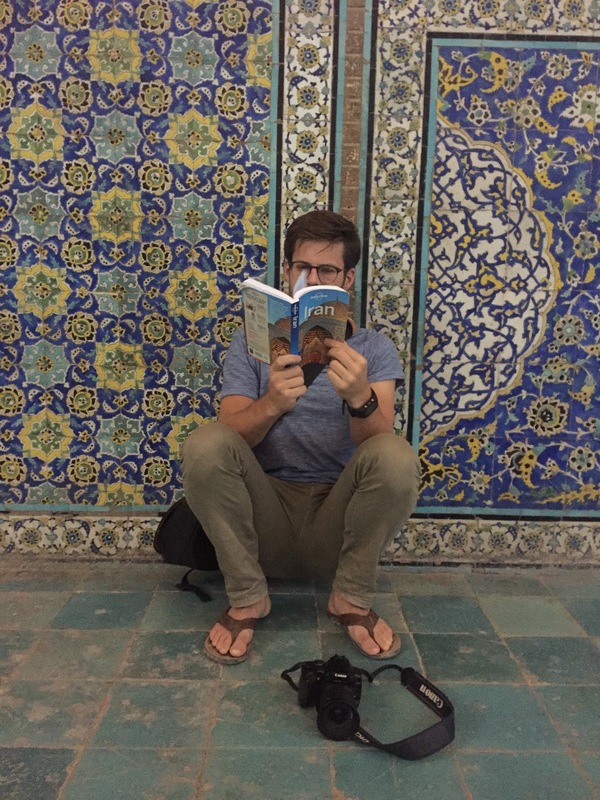 While taking photographs, we’re approached by a women who is teaching English in Iran and wants her students to have a chat with us. A lively and funny conversation follows and we get yellow pudding and carrot juice. We meet many more people on the square, including kids, all eager to ask where we come from and wanting to practice English. It feels a bit like being movie stars. 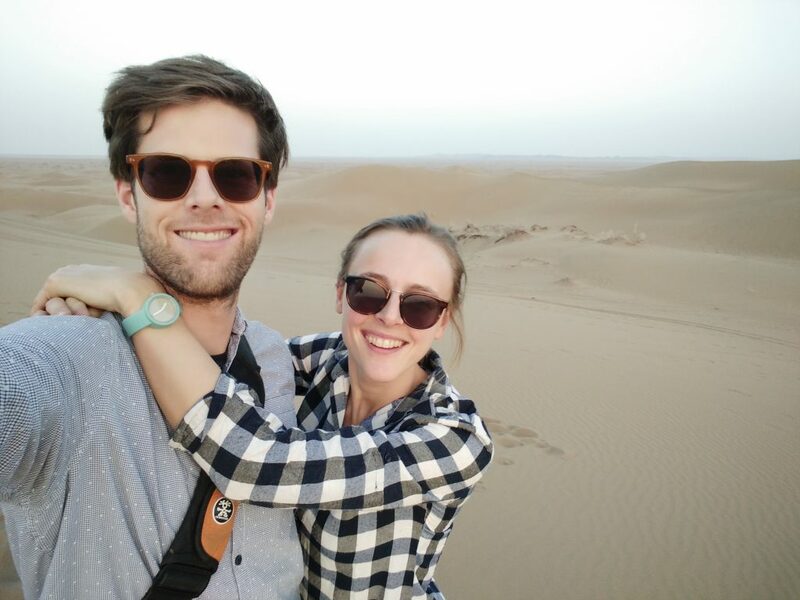 In the evening we stroll along a very busy shopping street, look for watches and eat falafel in a packed fast food restaurant. We continue over the Si-o-se (33) bridge, along the river, and back over the Qaju bridge. There are people everywhere along the riverside, eating food or smoking shisha. Slow start today, to make plans for next days. Via bazaar we arrive at the Lotfollah mosque, a mosque missing some typical elements like minarets and presumably only used by the women of the Shah harem. 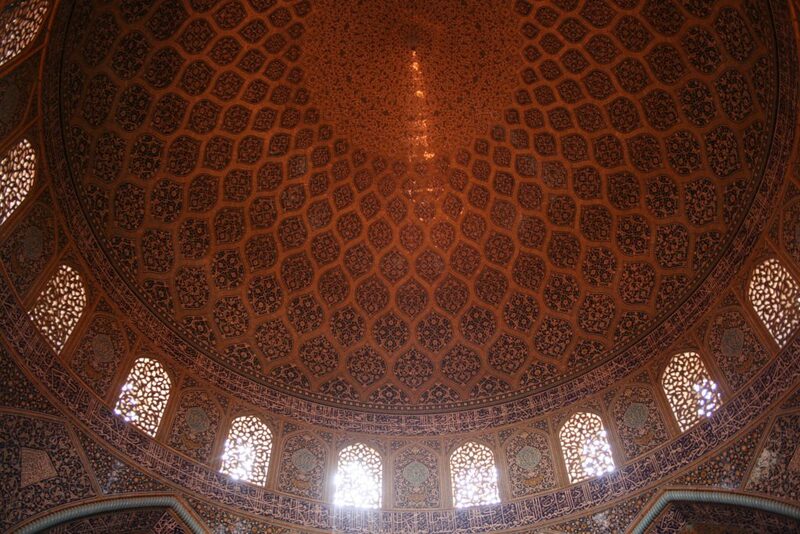 The interior of the dome is a true highlight of our trip, showing brilliant symmetry and rich decorations. The breathtaking interior of the Lotfollah mosque. 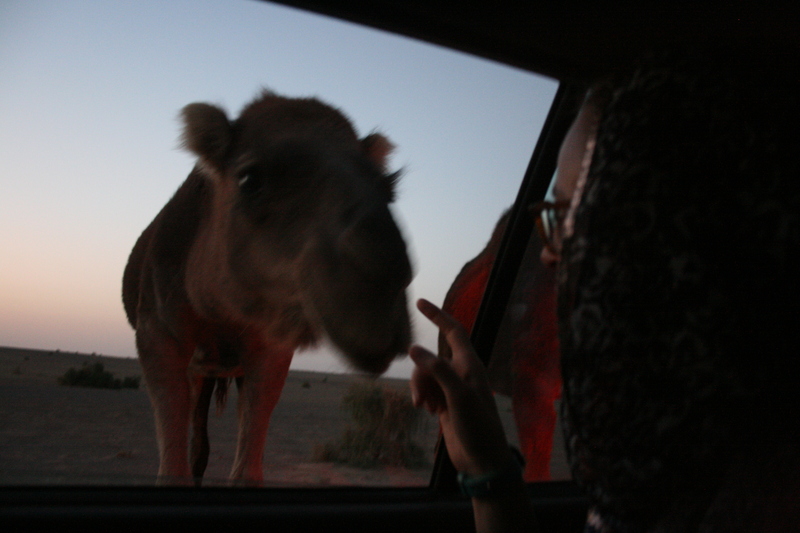 One of the major highlights of our trip. 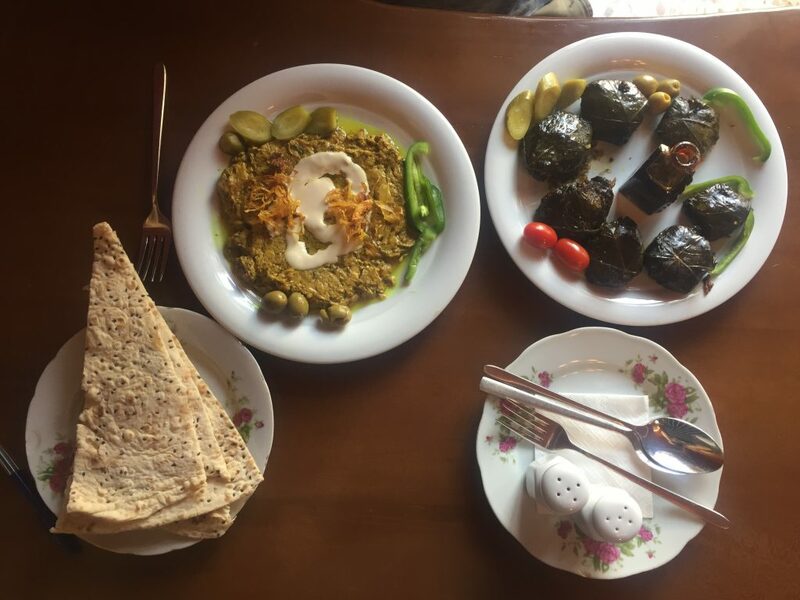 We take a taxi to Jolfa and have a great lunch at Firouzeh, next to the square: dolma with pomegranate sauce and an eggplant dish (borani bademjan). 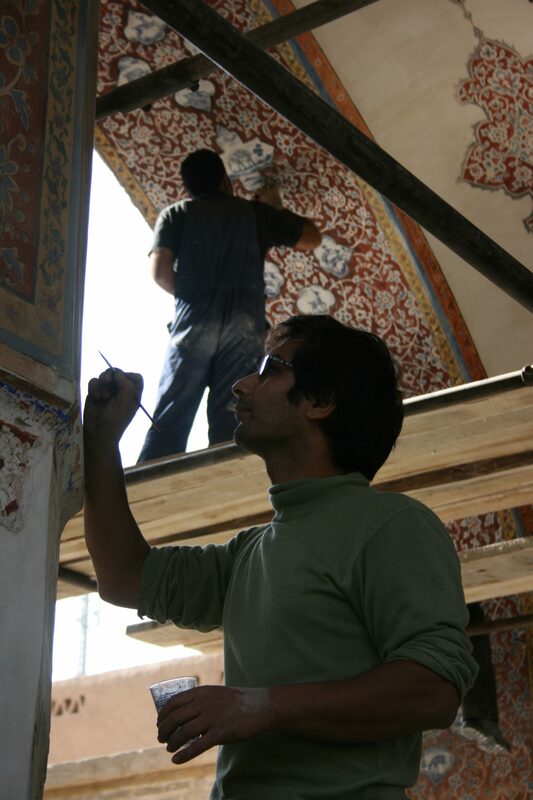 Continue to the Vank cathedral, an Armenian Church, fully decorated on the interior with paintings from the old and New Testament, but also containing Islamic elements such as the dome and the tiled walls. The museum shows old gospels dating back to 11th century BC. The Armenian genocide is also addressed. In the early evening we are picked up by the girls from the English class and they take us to the Soffeh mountain for drinks and some snacks, including corn fresh from the barbecue. 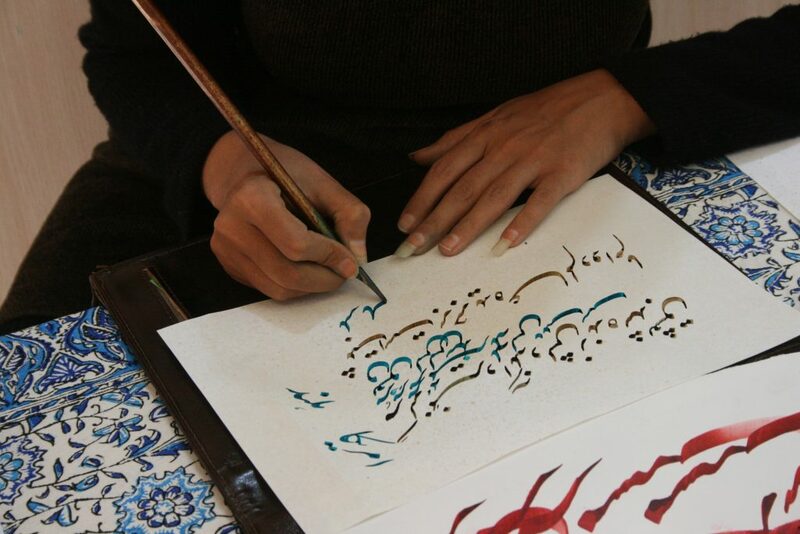 We have interesting talks and learn more about the Iranian way of living and the thoughts of the young people. 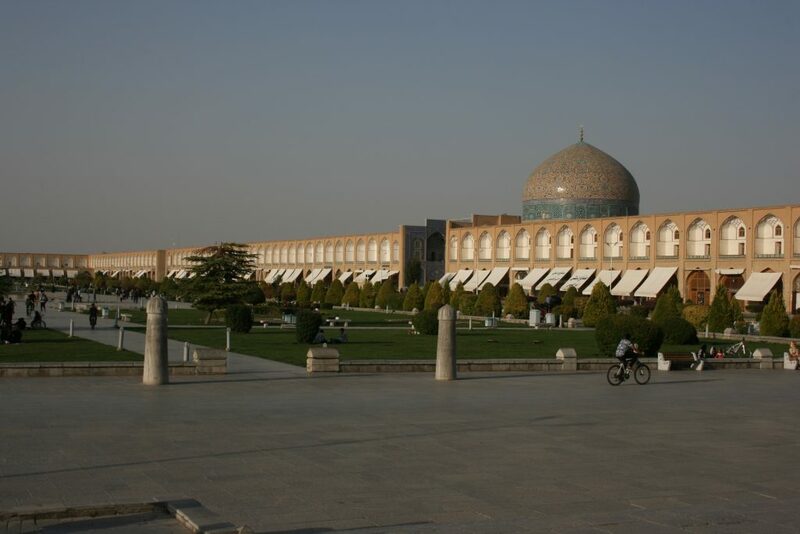 After administrative slowness at the hotel we take a cab to Kave terminal and the 10am bus to Shiraz. Traveling by bus is very comfortable and cheap. 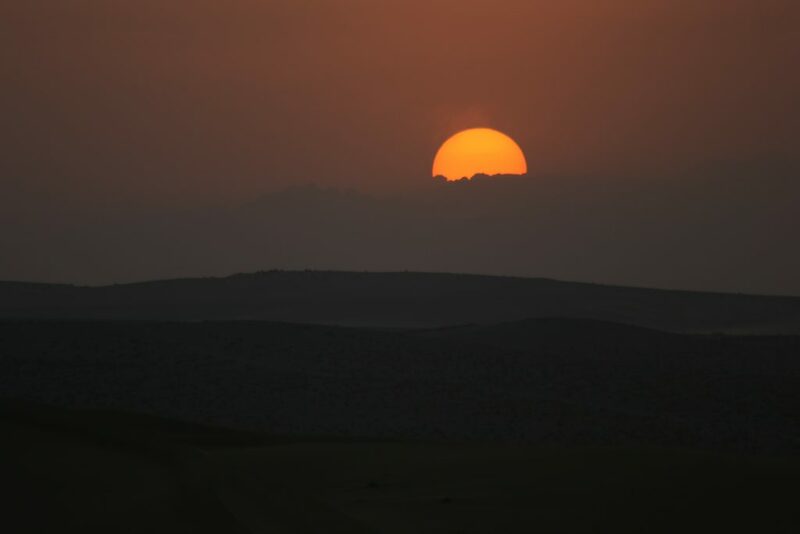 Arrival at Shiraz is just before sunset. 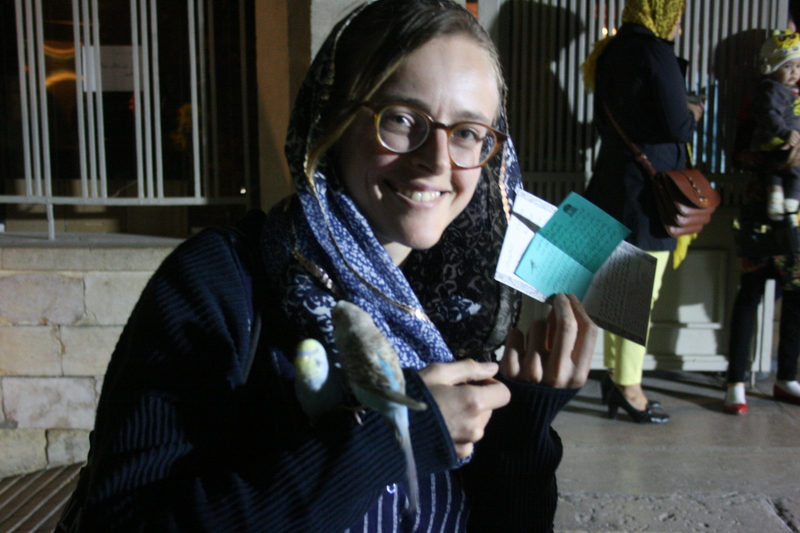 We first go to Hafez mausoleum, which is very crowded with Iranians, paying homage to one of the countries most beloved poets. 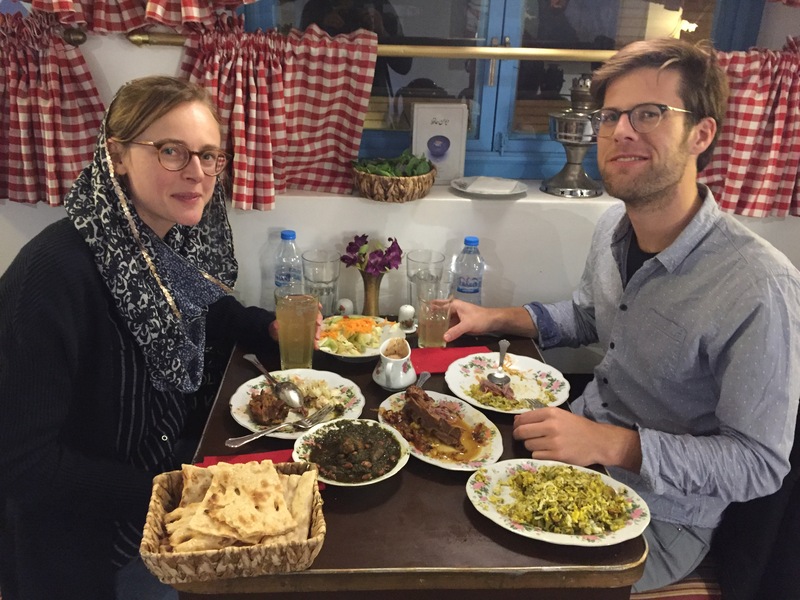 We then check out Persepolis trips at Parsian tourist agency and we go for a fantastic dinner at Ghayyam, with eggplant of course, before well deserved sleep at Niayesh hotel. 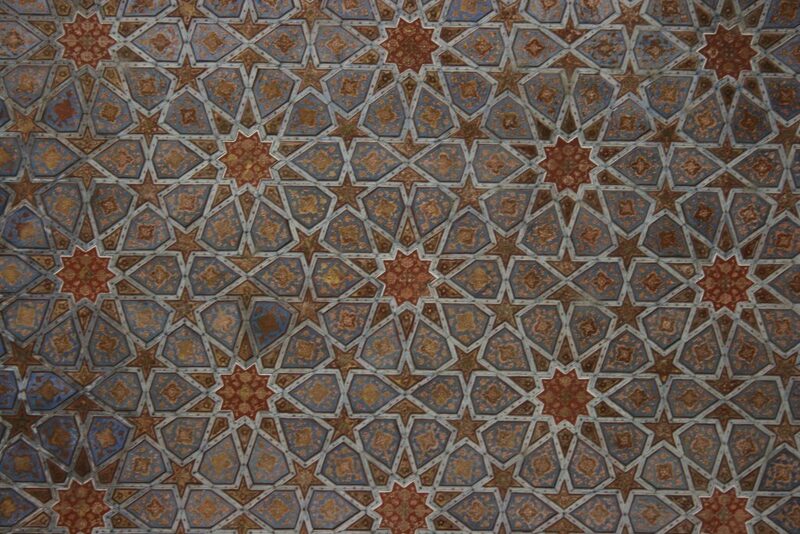 Early start to see the morning sun in the ‘pink mosque’, the Nasir al-Molk mosque. 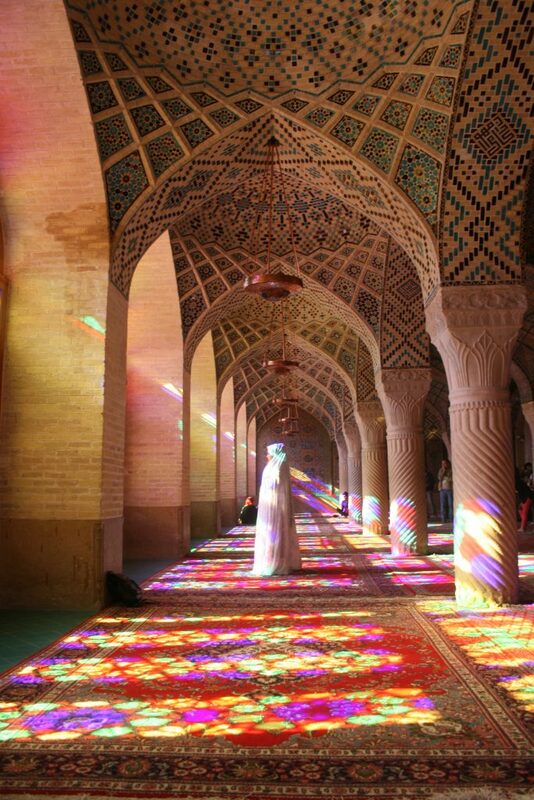 The colors in the prayer room are indeed overwhelming, but so is the mass of tourists that is already present here. 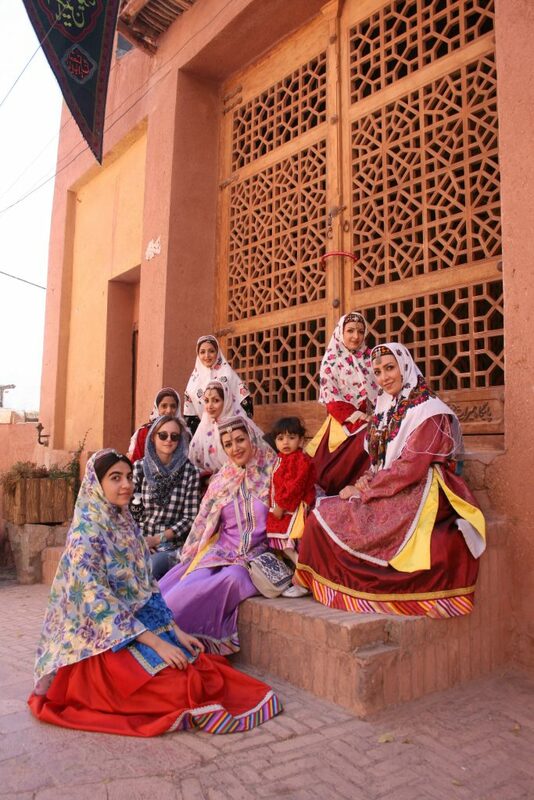 Especially a group of Iranian students make a lot of noise, which is quite in contrast to the relative peace and tranquility we have experienced so far in the historical highlights in Kashan and Esfahan. 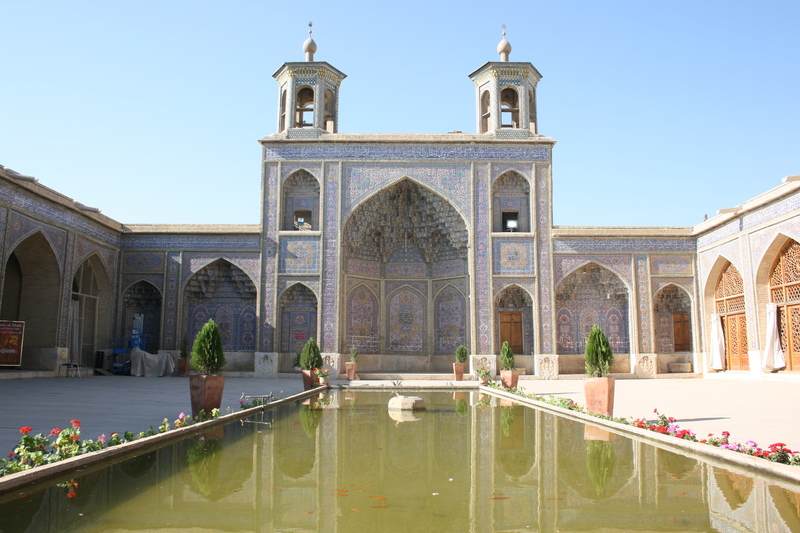 The next highlight is the Naranjestan-e-Ghavam garden, also built for al-Molk. 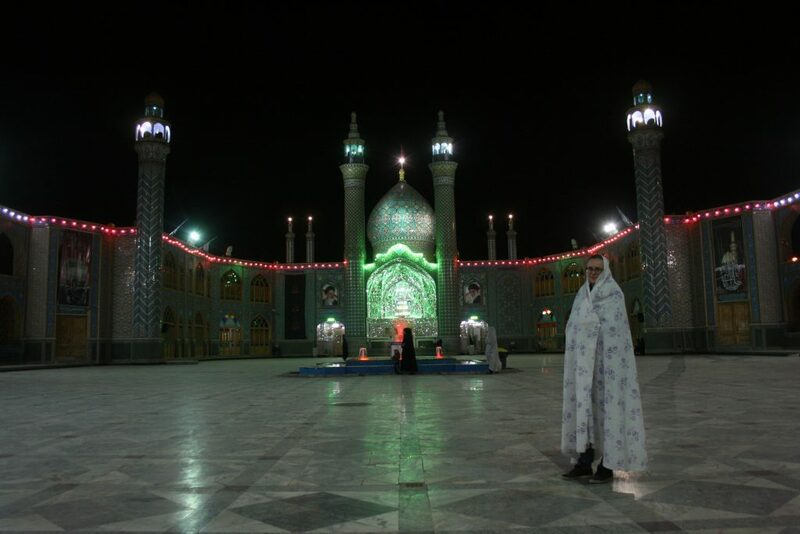 The Shah-e-Cheragh mosque we enter out of curiosity, although it takes some time before Lisa gets a chador and a guide necessary to enter. 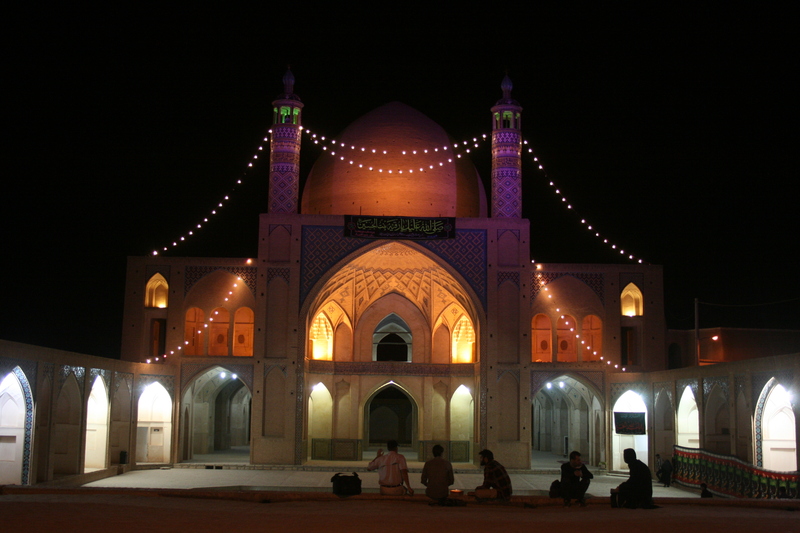 The premises consist of a new mosque, only 3 years old, in which prayers are going on, and an older part which contains the shrine of brothers Amir Achmed en Mir Mohammed, sons of the 7th imam. We take a long lunch break and chill in the nice cabins on the patio of the hotel. The waiter is rather impatient and forms a bit of a challenge, but in the end he’s quite friendly and funny and we get good and cheap food and a full pitcher of dugh. After a nap we set out for visiting another garden (Nazar) that includes the Pars museum, but this is not very interesting and could be skipped. Around the same time we have the first bad experience with a local, who tries to convince us to join him to some sight, and after friendly saying no to his request, he starts to swear. 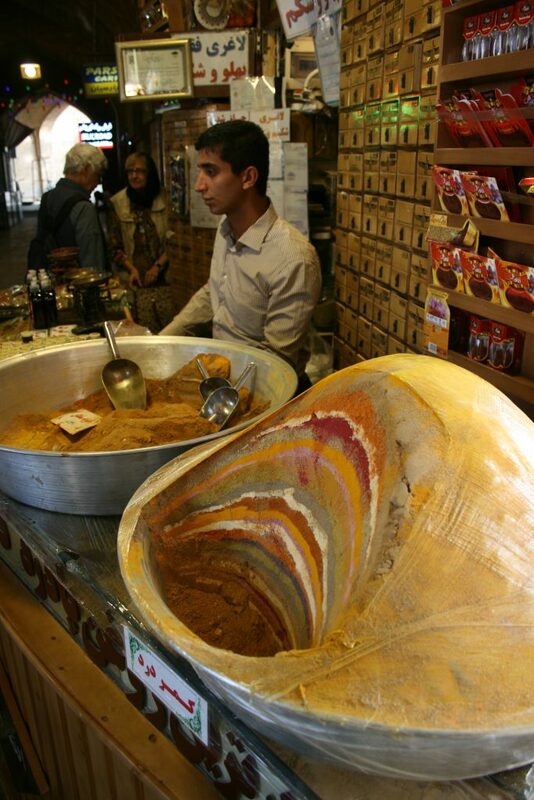 We walk through the bazaar, have some faludeh, look at rugs and camel bone boxes, but buy nothing eventually. We eat again at the hotel, since the food is so nice. 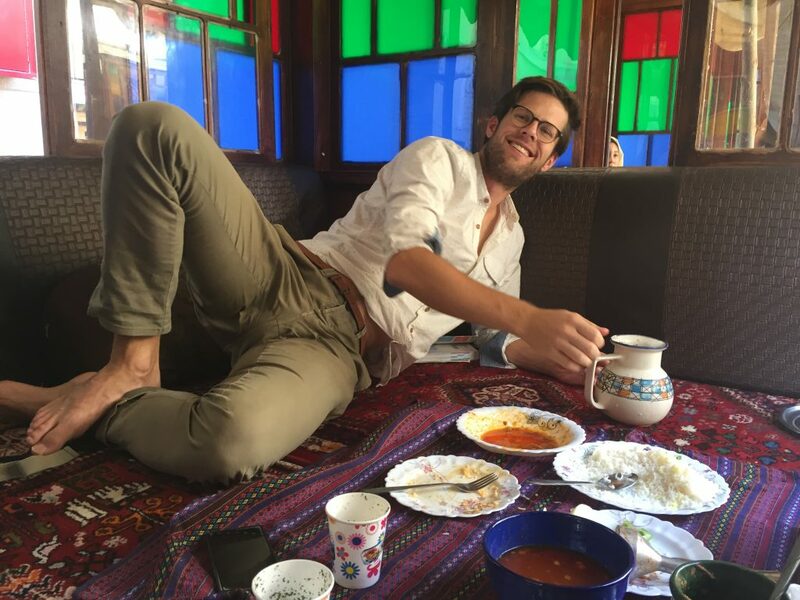 We meet three Dutch boys who use our phone to get transport to Alamut valley and we meet two French guys whom we saw earlier in Tehran. The wonders of Persepolis! 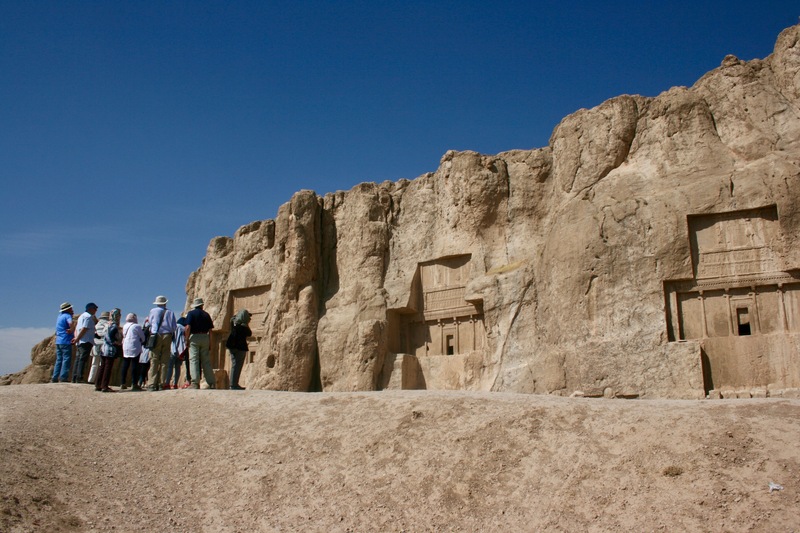 With a minibus and a guide we visit Persepolis, about an hour ride from Shiraz. This is a tourist magnet but for a good reason. 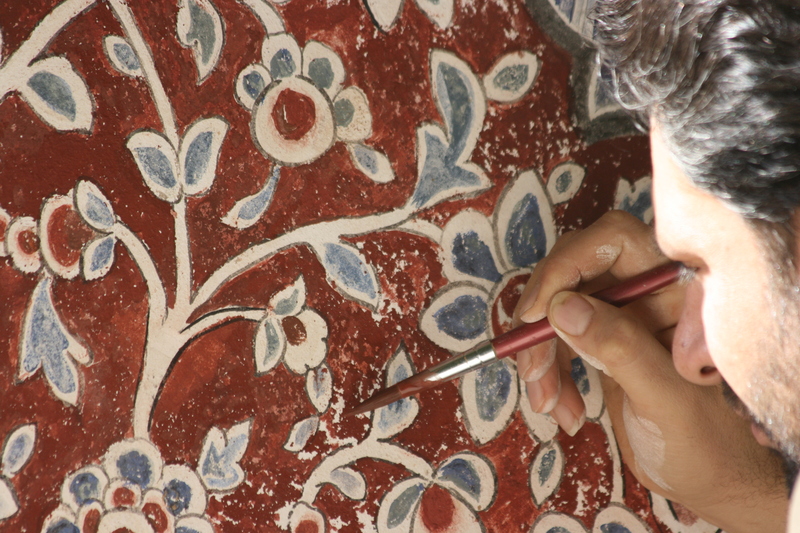 The staircase at Apadana palace leaves us speechless, not to mention that originally the bas reliefs were in color! Built around 500 BC by Aechemined kings, including Cyrus the great and Darius the great. 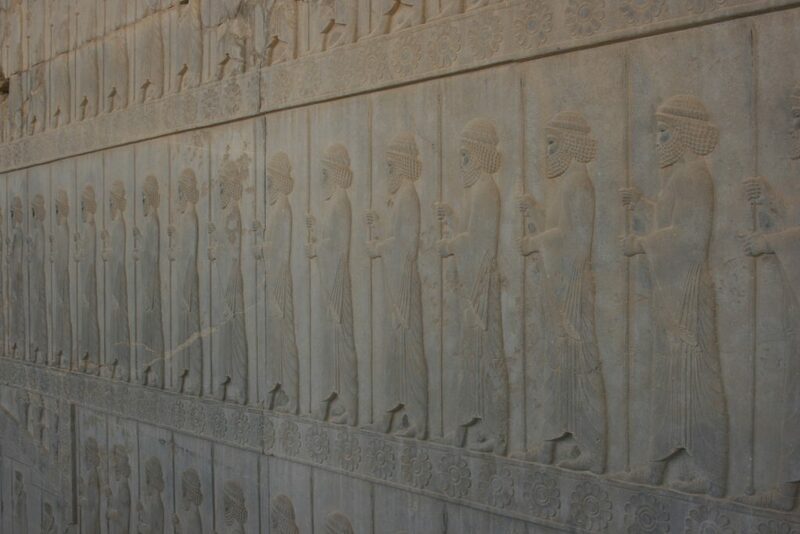 The triple frieze which shows all the people of the Persian empire bringing tribute to their king is like a history book in pictures. The symbols show the significance of the religion of that time, Zoroastrianism, one of the oldest monotheistic religions in the world. 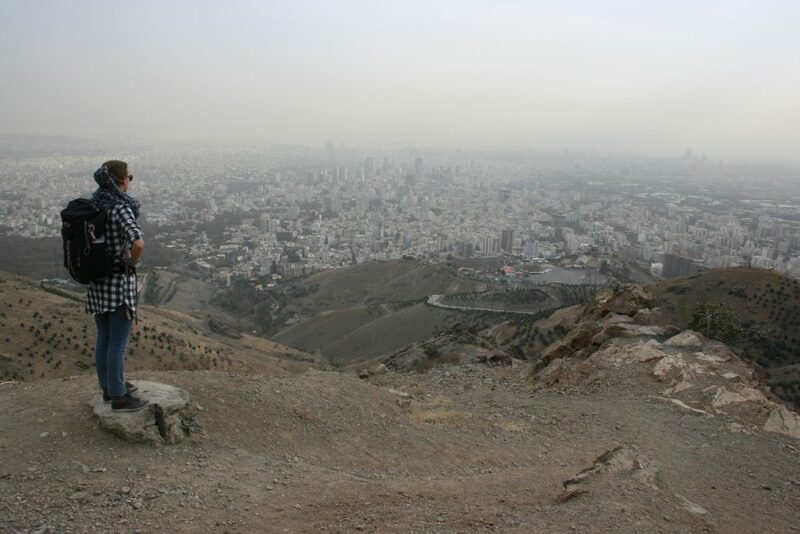 The views from Persepolis on the surrounding mountains are impressive. What a pity that Alexander the Great burnt down the palaces, leaving only the ruins we see today. 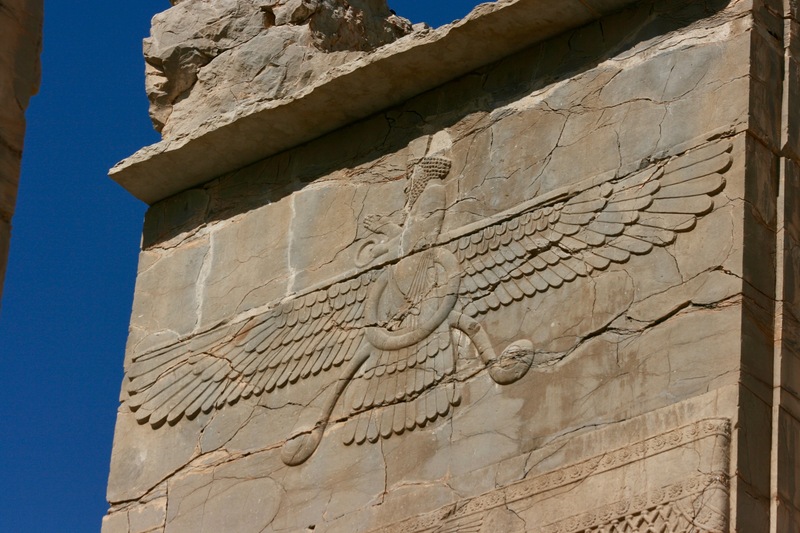 The typical symbol of Zoroastrianism, Faravahar, in Persepolis. 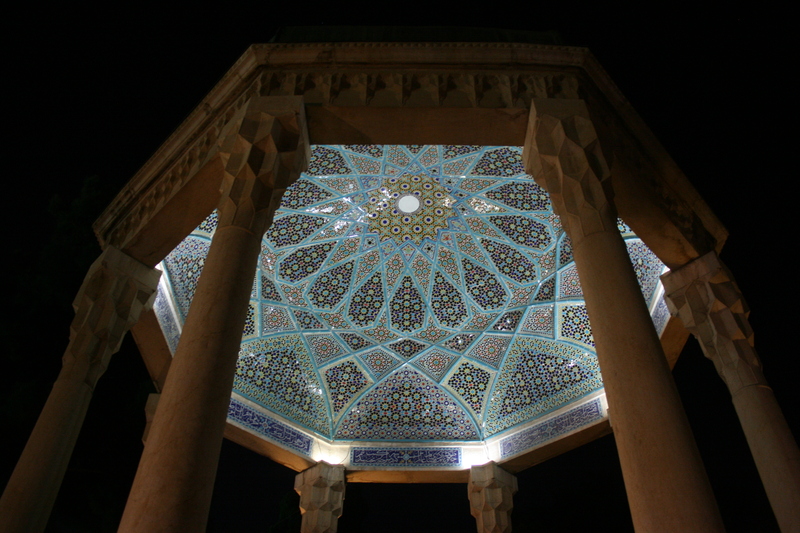 Still a national symbol for Iran. 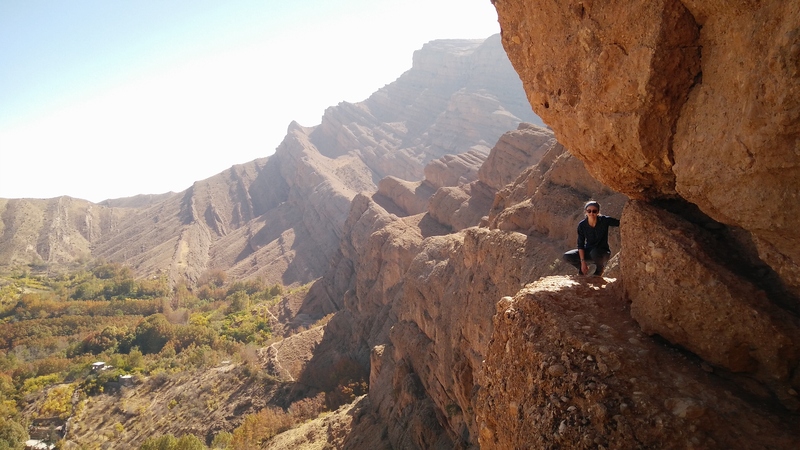 In the afternoon we try to contact Bahman for a tour in the mountains and sleeping with nomads. 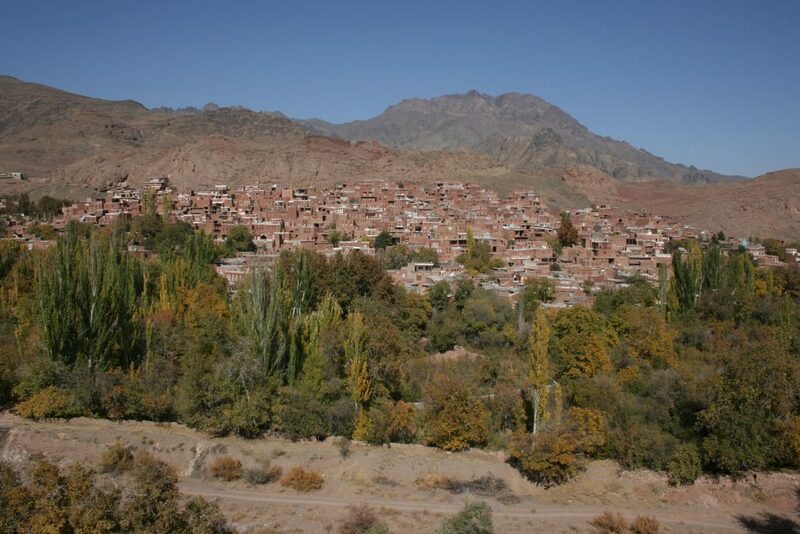 But it’s difficult to get in touch, and we opt for plan B, spending the night in the village of Ghalat. 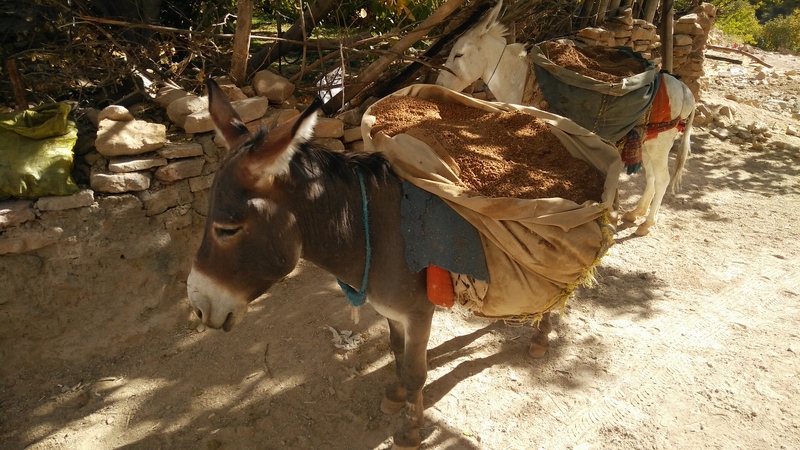 We get a lift from Afshar Jowkar, who lives in Ghalat but works in Shiraz, and rents out an apartment in his house. 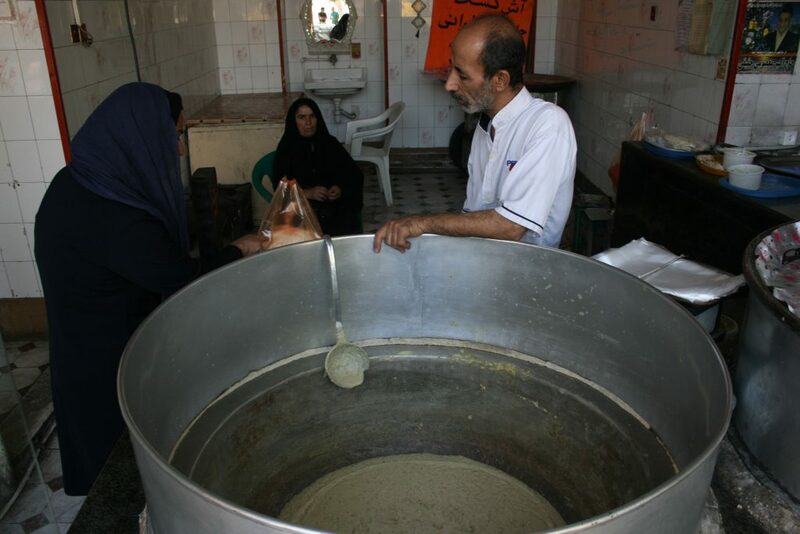 He and his wife Zahar invite us for dinner and make us delicious bademjoon. It is super nice to be in their house, where scarfs are absent, and we can talk about politics, religion and so on. 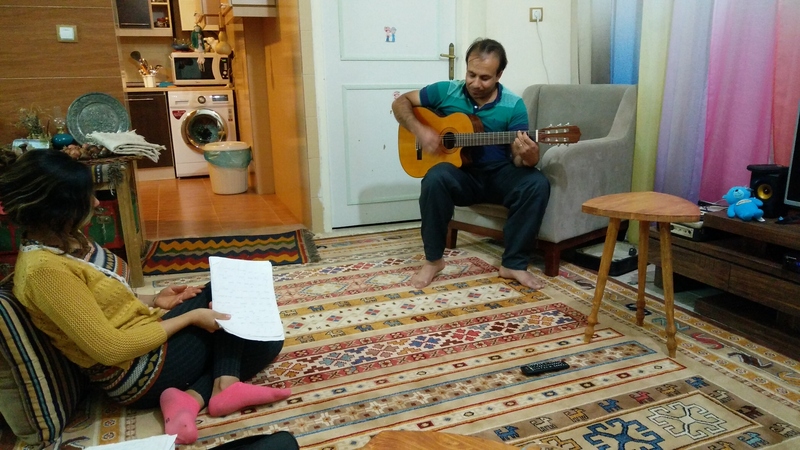 Afshar shows us their wedding video and plays guitar music, creating a nice and welcoming atmosphere in which we get a look into the life of Iranian people. 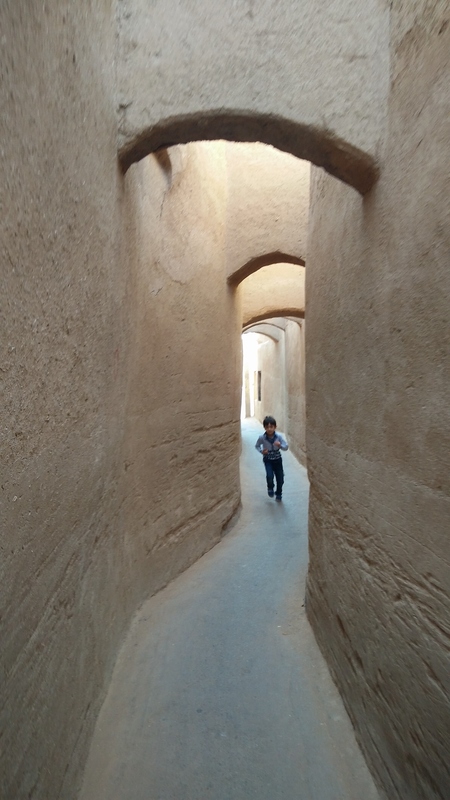 In the morning we walk to the historical village, also known as little Amsterdam, because of the free spirits who come here in the weekend from Shiraz. The village is now desolated and we continue to find a path into the mountains. After some trying we find a great path with a balcony Ike view in the old village, which is surrounded by trees in autumn colors. 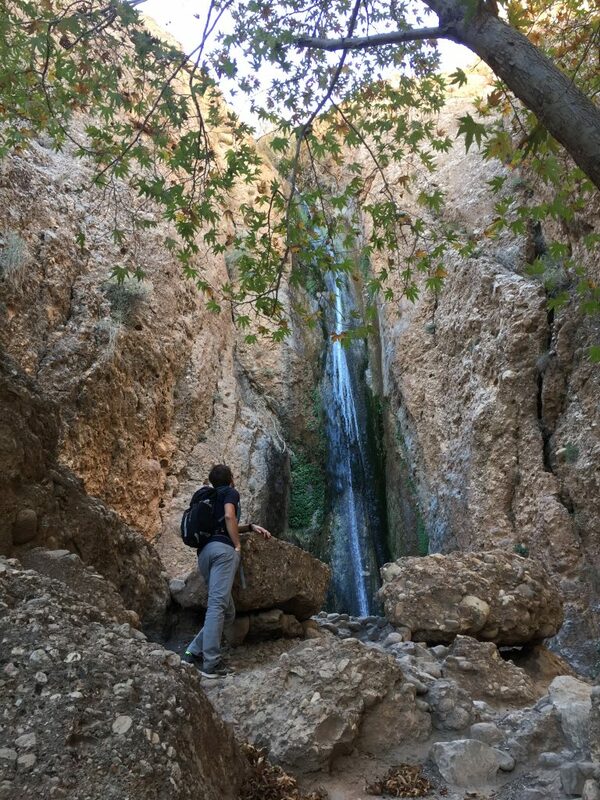 On the way back we pass by a waterfall where we meet two guys who offer us tea (which they carry, or course). 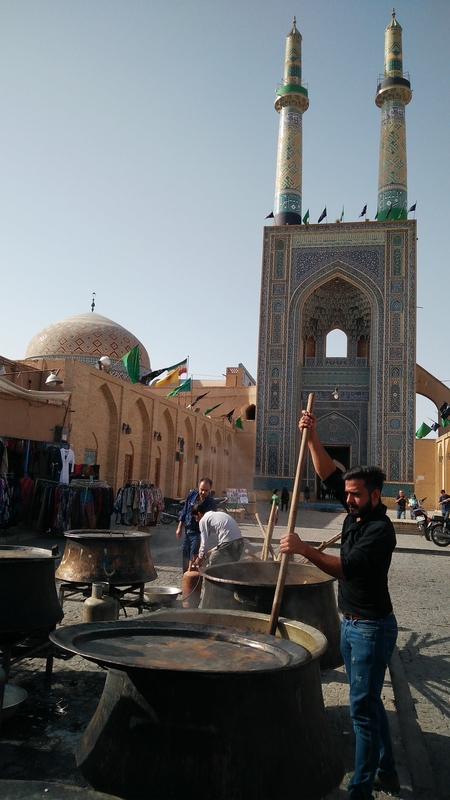 After a nice omelette lunch in the village, we quickly find a local driver who brings us back to Shiraz, where we take the bus to Yazd. 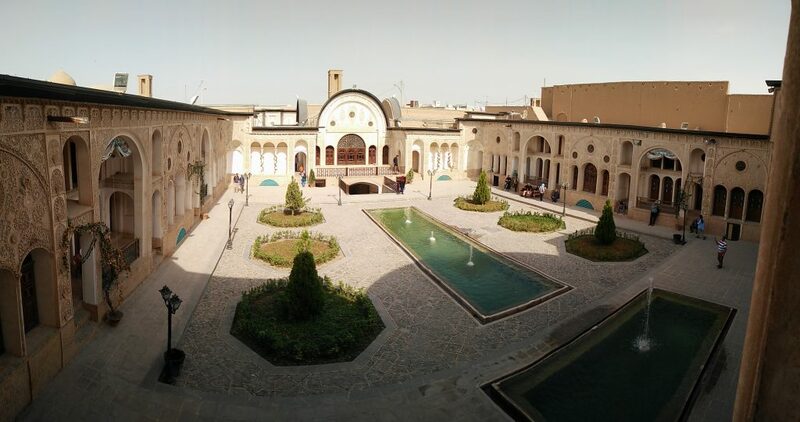 In Yazd we take a taxi to the Orient hotel, where we are lucky and have a VIP room. The French-Greek-Iranian owner of the nearby cafe de Paris prepares a great (beef!) burger before going to bed. Lisa’s headache that started yesterday has become more serious and we take it easy. A visit to the artists house, the Jammeh mosque, and the water museum. In the fantastic mosque we are approached by a family who asks is if we want to come to their place in Mehriz the next day (Friday, so weekend), which we kindly accept. Jammeh mosque and preparations for ash (soup) marking end of mourning. Rooftop dinner at Baam cafe – great view, food so so. 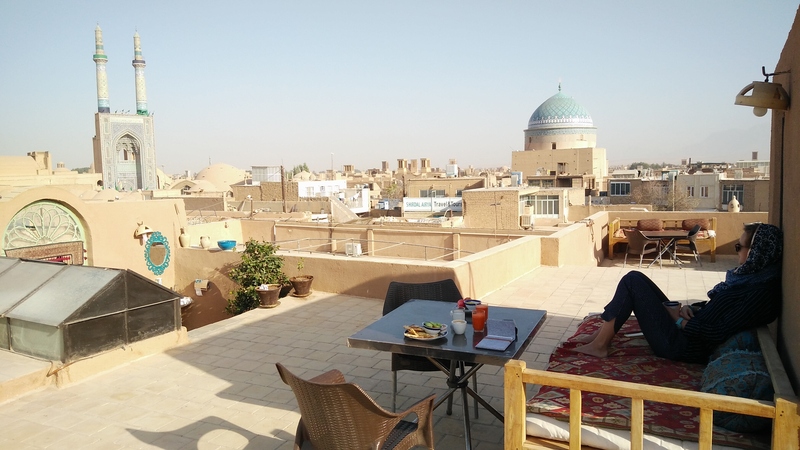 Breakfast in our hotel in Yazd. In the morning we walk to the Zoroastrian temple, finding the same symbols that we found earlier in Persepolis. Then we take a taxi to the wind towers, a somehow mysterious place where deceased people where not buried, but given back to nature by having the he bodies being exposed at the top of the towers and being eaten by vultures. 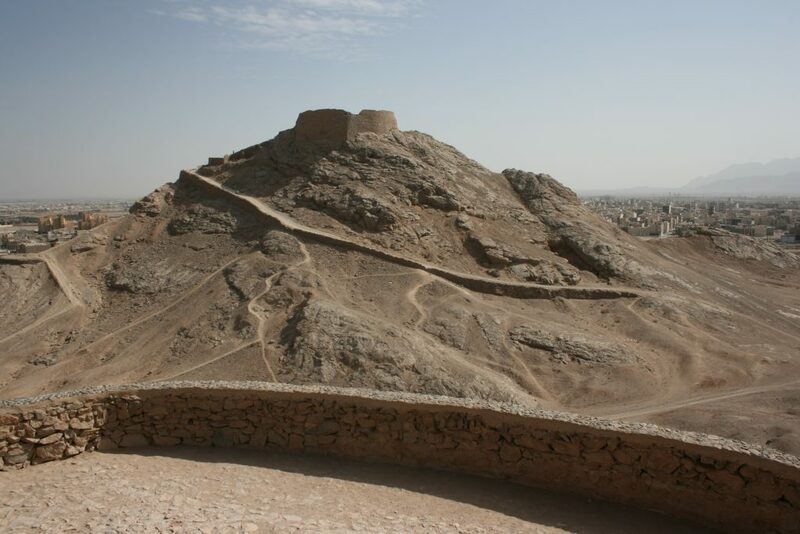 On top of the towers silence – burial ground for the Zoroastrians. The taxi then brings us to family Salek, where we are very kindly treated with fruits, and the with lunch, khorest sabzi. We have a last cup of tea with fantastic view on the mosque. 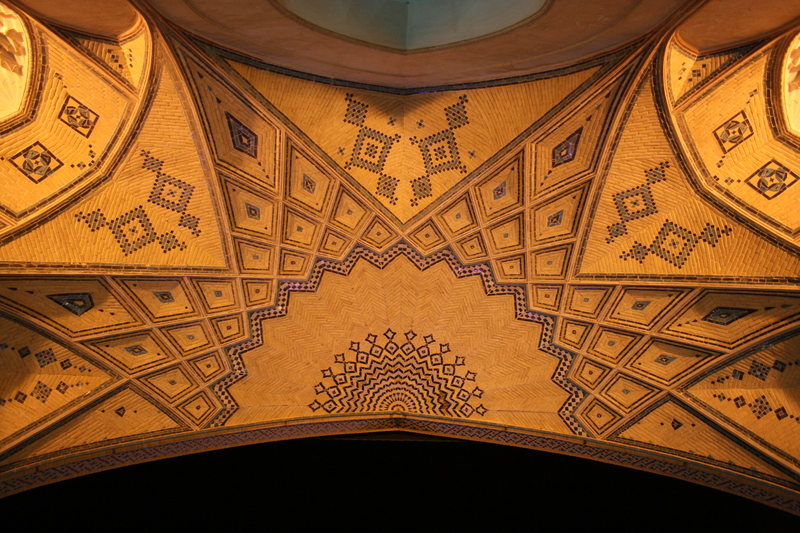 At 6 the taxi driver wakes us, small communication mistake, but we quickly get ready and around 6:40 we are at Yazd airport. The security check is hilarious, Lisa gets checked in the women’s section and is ‘touched’ on some peculiar places, while suitcases are piling up just after the entrance. In Tehran we arrive at the domestic airport and take the metro to Tajrish, from where we take a taxi to the hotel (150000). 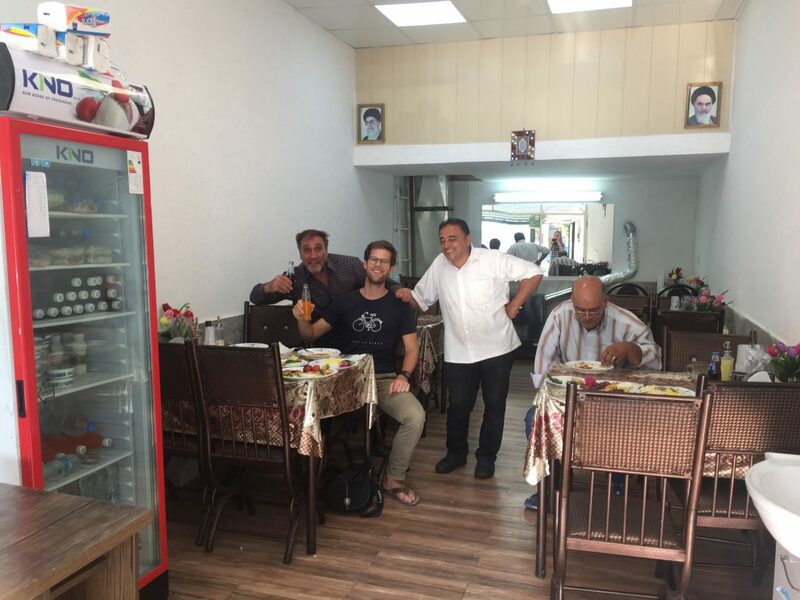 We then go for lunch to Chez Vous, where we have the best cappuccino in Iran so far, in the first hipster-like place that we visit, run by a couple of friendly and somewhat shy guys. With a taxi dar baste we go to the Tochal ski lift, where a big disappointment waits: the lift only operates Tue-Fri. As alternative we go for a hike up the mountain, which surprisingly turns out to be much more interesting and rewarding (and potentially dangerous) then initially thought. 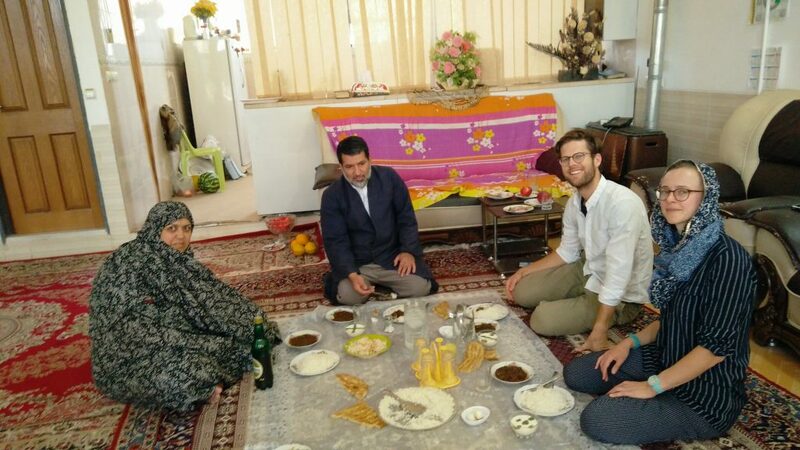 After our hike, we take a taxi to Darakeh, a village in the north of Tehran, to have dinner. Our last hotel is nearby and luxurious, we have an upgrade to a junior suite because the normal rooms are occupied. We have nice breakfast and easy start of the day, before we take the metro back to the airport and the flight back to Amsterdam. 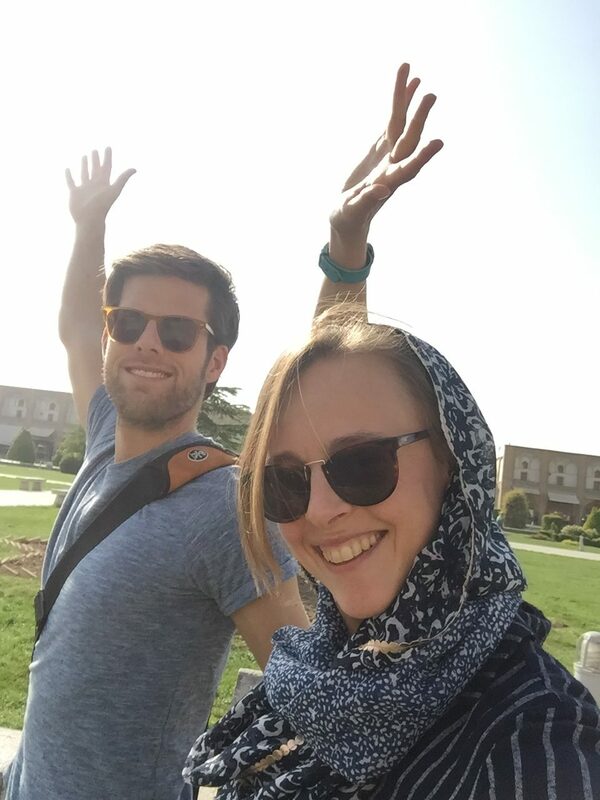 We met many Iranian girls who don’t want the hejab (head scarf). So many people want to learn English!!! Political opinions… most say that Rouhani is better than Ahmedinejad, but still disliked. We see quite some young girls with nose corrections. 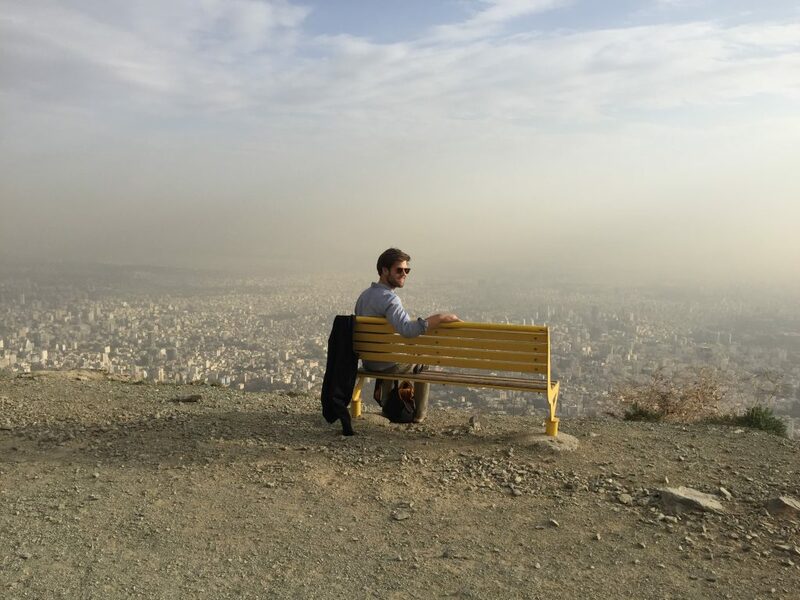 Young people find it difficult to get a job, they want to get out of Iran. Iranians are proud of the martyrs of the Iran-Iraq war, there are portraits at many places. 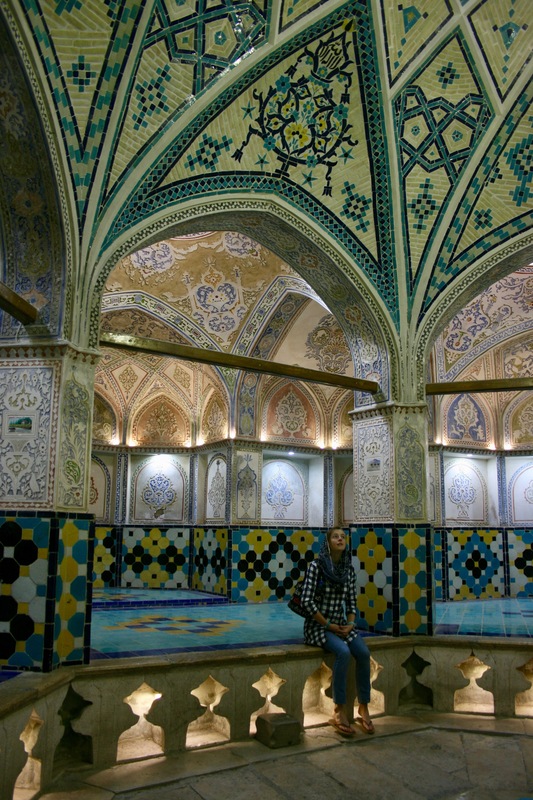 Iranians are very calm in public areas such as metros. Iranian queueing is very much like Iranian traffic. Whoever is most assertive and least afraid goes first. Iranians don’t mind if you don’t buy from their shops or if you don’t enter a sight because you think it’s too expensive.